Melilla Airport is situated three kilometres southwest of the autonomous city, which, due to its privileged location, is the gateway to Africa, the continent that is the current focus of all the attention of the business and tourist sectors. Its air, sea and land communications make it a potential operations base for both those who seek the commercial benefits of the African market without abandoning EU territory, and tourists who are travelling to Morocco and wish to stay the night in a European city. In 2005 the airport handled 271,589 passengers, 9,296 flight operations and 323,2 tonnes of cargo traffic. In October 1913, armed conflict with Morocco obliged the Spanish government to establish permanent aerodromes at Sania Ramel, Arcila and Zeluan. In 1921, Moroccan troops took control of the territory around Melilla, including the aerodrome at Zeluan, which forced the military aviation to look for a new aerodrome. The chosen site was in the area of Cabrerizas Altas, to the north of the city of Melilla, where the aerodrome comprised a narrow rectangular airfield, the long side of which was only three hundred metres. Once the Spanish army had retrieved the occupied territories, the aerodrome was transferred from Hípica to a plain of 8 km2 south of Nador, by the village of Tauima. The facilities were no more than a few hangars and portable countryside workshops, surrounded by a protective wall. At the same time the El Atalayon Hydroplane base was set up in the Bay of Mar Chica. The two aeronautical bases were to play an extremely important role in the Alhucemas landing, in September 1925. After the armed conflict was over, the aerodrome's facilities were improved, and in the 1930's the wooden control tower was replaced by a masonry tower. The aerodrome at Tauima was officially opened for civil traffic, by decree from Sultan Dari, on 27 July 1931. On 17 July, at the beginning of the Spanish Civil War, rebel troops occupied the aerodrome. A number of routes were inaugurated, both from the Tauima aerodrome and from the hydroplane base at El Atalayon: Rome-Palma de Mallorca-Melilla-Cadiz; Melilla-Seville; Melilla-Tetuan, and Melilla-Malaga-Seville-Lisbon, all of them run by the Italian airline Ala Littoria. When Italy entered the Second World War, the routes run by Ala Littoria were suspended and this company was replaced by TAE, which in turn, in December 1940, was replaced by Iberia. The only route that would be kept going was the Seville-Malaga-Melilla one. In the mid-1940s, runway 08-26 was built which, measuring 1,400 metres long, occupied all the available space. In July 1946, Tauima airport was declared a port of entry and was opened to domestic and international traffic. In 1955 builders were allocated for the construction of the control tower and the transmitter station, but following the proclamation of the independent Kingdom of Morocco in 1956 the Spanish government was obliged to withdraw, little by little, its airforce units from the liberated territories. In 1958 Tauima Airport was still included in the Spanish Airport Investments Plan. 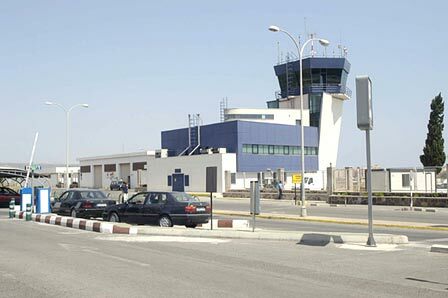 The establishment of the border between Melilla and Morocco obliged the airport to adjust to this new situation. It was only possible to access Melilla from Tauima by means of a "sealed" bus. 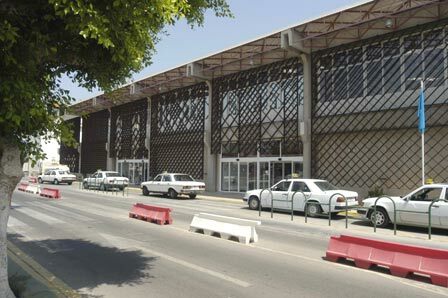 This situation was maintained until 1967, when the construction of an airport in the city of Melilla was included in Spain's 2nd Economic-Social Programme. The land chosen, practically the only space available, was made up of a number of plots that lay southwest of the city, close to the old Yasinem road. The works were assigned to construction companies in October 1967 and the radio-electrical equipment was installed in December 1968. In July 1969 it was declared open for civil, full domestic and international passenger traffic. Once the airport commenced operations, the airline company Spantax began to run commercial flights from Malaga, with a frequency of three flights a day. In 1974 the runway was extended and the airport received its first non-scheduled flights. 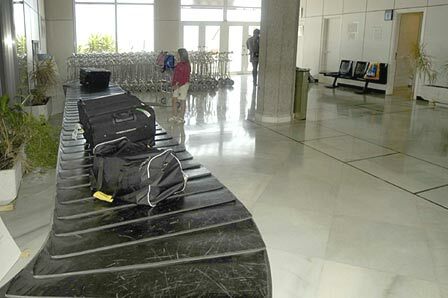 In 1997 improvements were carried out in the cargo terminal and in October of the following year the airport customs services were extended, allowing the airport to deal with international cargo traffic. 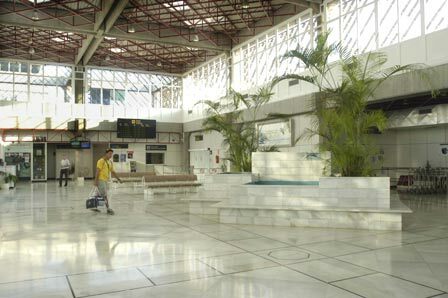 In August 1981 the terminal extension came into service, which duplicated the airport's previous capacity. Spantax was replaced by Aviaco. In 1982 the runway was extended again and in 1984 the aircraft apron was enlarged. In 1992 Binter Mediterránea replaced Aviaco on the Malaga route. A further extension to the passenger terminal was finalised in April 1998, whilst at the same time works began on extending the runway. In March 1995 the new facilities were opened and in 2002 the new control tower was inaugurated. Finally, in February 2005, the airfield extension was implemented. This extension made it necessary to build an underpass for road access to the airport, which was carried out via a 240-metre long tunnel. LGT PAPI Rwy 15 GS 3.4 , Rwy 33 GS 3.1 . Rwy 33 thld lts O/S til 14 Jun 06 est. OPR HOURS Opr 0700-1730Z (0545-1830Z sum) plus 30 min PPR. RSTD PPR due to ltd apn til 21 May 06 est.